TriPollar® is an advanced radio frequency technology-based treatment for skin tightening, body shaping, reduction of cellulite and wrinkles. The technology itself has been used safely for over 75 years in medicine, and TriPollar’s RF technology is a proprietary design that overcomes the limitations of monopolar and bipolar technologies. The result is younger looking skin that is noticeable immediately while promoting the treated area for long-term skin remodelling. The science behind TriPollar® is based on the production of collagen and elastin by fibroblast cells in the dermis. When they are heated, two things happen: the elastin contract and are pulled closer together resulting in immediately tightened skin, while the deep heating effect accelerates collagen regeneration. In your TriPollar® session, glycerin is first applied to your skin. Then, the TriPollar® handpiece is used to massage the treatment area. It is during this heated massage that your skin is stimulated to tighten and regenerate–all without vacuuming, suctioning, or skin irritation. Q: Is there any downtime after a TriPollar® treatment? A: There is no downtime after a TriPollar® treatment. You can return to your daily routine immediately after treatment. Q: How long does a TriPollar® treatment take? A: A TriPollar® facial treatment can last between 30-60 minutes, depending on the area you are treating. Q: How does the TriPollar® facial feel? A: During the treatment, your skin may feel warm. For a few hours post-treatment, your skin may look pink due to the heating sensation. Q: Can delicate areas be treated by TriPollar®? A: TriPollar® technology is gentle and non-abrasive so it is able to treat fine lines and very delicate areas of the face without fear of causing pain or abrasions. 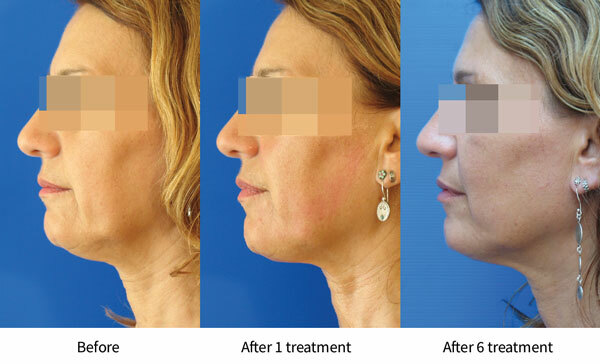 Q: What are the results I should expect from a TriPollar® facial? A: The treated area will feel and look tighter and firmer.